Surf lessons Hossegor the best quality and value on the coast. Guaranteed best rates & value, find better and we will match it ! ISA Level 1 & 2 qualified instructor with 40 years surfing experience. Most experienced surf guide Hossegor, guaranteed to find best waves. Small groups of 5 max, smallest groups on the coast ! Find better and we will match it. Private lessons tailor made after an assessment from beginner to intermediate. Surf coaching with video analysis for intermediate to advanced surfers. All equipment provided for beginners. Intermediate-advanced coaching with video analysis. Whether you or are a complete beginner or already surf but want to take your surfing to the next level,”Surf lessons Hossegor” will help you progress faster, refine your technique and master new moves! We hear too often of students that have had a nightmare in a big group of 8 with sub-standard equipment and not had a pleasant learner environment or experience. If thats you why not turn the clocks back and slingshot your surfing skills with some private lessons. This is for people who want to progress fast in the peace and quiet of a private lesson! At Surf Lessons Hossegor we believe that the learning environment is everything when improving your technique or are totally fresh into surf.We have heard too many stories of people that have spent good money to really progress during there holidays and ended up in a massive group. Big groups of 8 are the norm here, usually with beaten up boards and under paid instructors ………. We pride ourselves that we have our students learning experience at heart and for this reason we keep our groups small our equipment new and the stoke factor to the max degree. With a maximum of 5 people ( unless requested for more) you will receive the attention you need and have paid for, to progress faster and achieve that manoeuvre. 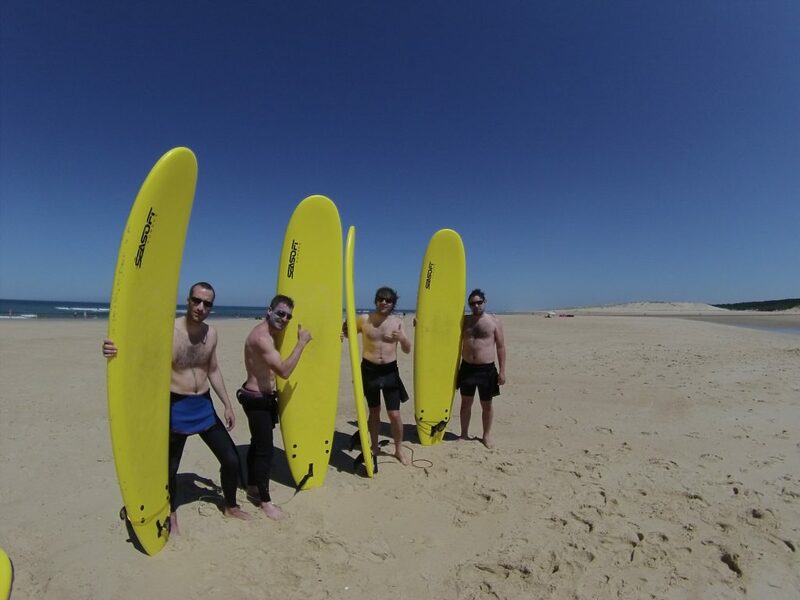 Leave the beach with a smile after some small group surf lessons Hossegor. Small group surf lesson for 2 -5 people. Learn at a beach carefully selected to suit your ability. Surf lessons Hossegor understands the exact reason that people may be looking at this page. Youve seen the French perfection in the mags and movies and now its your turn. Don’t waste valuable time looking for the best waves, you may luck out and score a good surf , but its unlikely that you will have enough luck to find the perfection that this area has. Our surf guide covers a huge area, and has pleasure in saying that this area is surfed every day by us. The sand banks move from week to week so , get local knowledge and surf the best secret spots. You know it makes sense , you came to surf the text book French waves , so lets go surf them. Take back control of your body and seriously improve your technique. This is a kind of masterclass of surf coaching. Students do need a good level of fitness for this lesson.We start as early as the student can , usually at sunrise or just before to beat the crowds the wind and the heat of the summer. After a brief pre course assesment we will warm up and have a specially surf formulated stretch, and give you the information you need to understand your body in relation to your surf ability. 4hrs intensive coaching from 8-12 am or earlier. Led through the line up helping the choose the best waves. Intensive work on areas of your technique that need improving. This course is for the more experienced surfer who has a level of surf instruction already under their belt. This course is for the instructor that wants to move on to becoming a coach. Learn how to explain the mechanics of all the vital manouvers and take an intermediate surfer right up to advanced level. For more information on prices please View Prices Page or Contact Us.